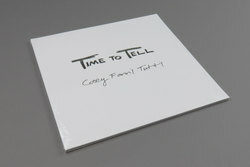 Cosey Fanni Tutti - Time To Tell (Deluxe Edition). Vinyl LP. Bleep. First official time on vinyl for this gem in the Coum / Throbbing Gristle archives. Cosey’s solo tape from 1983 contains some of the most raw, emotive music that ever came out of those studio sessions. Strange, brooding and ominous ambient synth with manipulated recordings of a lecture Cosey gave to the fine art students at Leeds college that year. Think of the ghostly magic of TG’s ‘Hometime’ (a solo Cosey composition nonetheless) and you’re on the right path. Pulsating, ceremonial horror soundtrack vibes on ‘The Secret Touch’ add to the package. Great reissue, done the right way.